They say one man’s trash is another man’s treasure. This statement couldn’t be anymore truthful in Recycling Workshop, my app pick of the day. 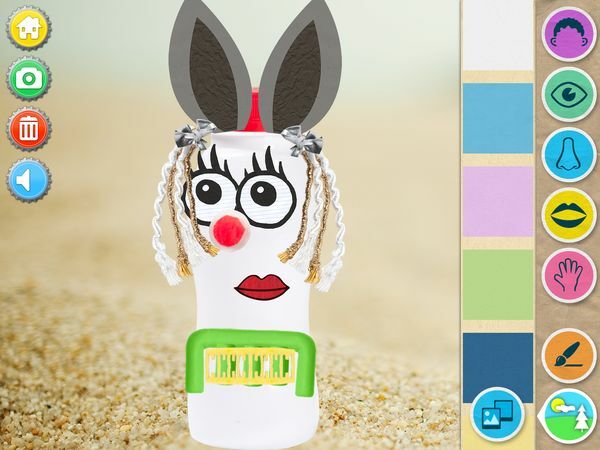 The latest release from developer Jump App, it is a creative sandbox in which kids can fashion new toys out of household junk. Kids begin by selecting a base out of empty containers such as bottles, cartons, and cans. They can then transform it into a silly character by adding facial features, body parts, and other decorations from the provided library. The app has an extensive variety of features, including eyes, noses, mouths, hair, horns, and even wings. Most of these are cut-out drawings, but there are some made out of everyday objects such as ribbons and buttons. Kids can scroll up and down in each category to see all the available options. To affix an item onto the body, kids simply drag it onto the desired spot. They can resize, rotate, or flip the item as necessary using their fingers or the control buttons on the top of the screen. They can also undo the changes they made, or remove an item entirely. The app allows additional customization using a simple drawing tool. Kids can also use their own photos as backgrounds for their character. After the work is completed, they can save their creation to Camera Roll. The app automatically saves all the work made. It means that kids can revisit their characters later to continue their work. Should they wish to start over, they can tap on the trash icon to clear the item on the workspace. Kids can personalize their characters further by naming them. The app assigns a name for each base by default, but they can overwrite it by tapping on the name shown on the base selection screen and then entering their own. Like other releases from Jump App that we’ve reviewed, Recycling Workshop is simple and easy to use. Younger players may require some help in the beginning to place items exactly where they want, but the learning curve is gentle. The control buttons also make it easier to manipulate the items on the screen. For more details on how to use the app, parents can take a look at the guide in the protected parents’ section. You can also turn on or off music, sound effects, take a snapshot feature, and more apps banner from within this menu. Recycling Workshop has no third-party ads or in-app purchases. Creative and imaginative, Recycling Workshop will fit right in with crafty kids. The app has no rules or scores. Kids decide freely what they want to make, whether it’s a superhero, a princess, or even an animal. With 20 unique bases and over 150 decorative items to choose from, they can make all sorts of combinations. One thing I like about the app is it allows kids to engage in handicrafts but without the mess — no more scrubbing paint off the kitchen floor! 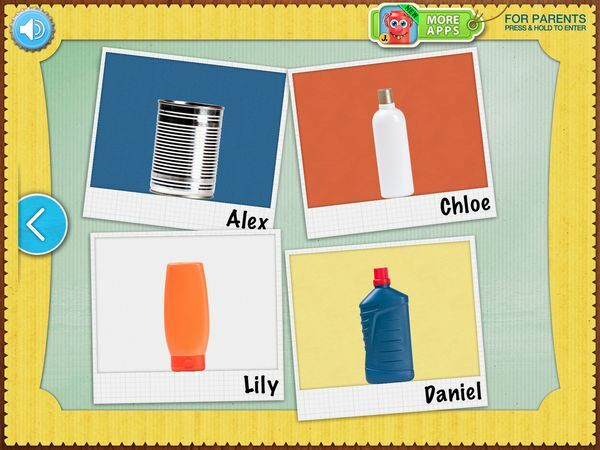 I also like how the app promotes recycling and environmental awareness by showing kids that with some creativity, they can extend the lives of throwaway items. Presentation-wise, the app is bright and colorful. The cheerful music, which unfortunately does get old after a while, can be turned off easily from within the app. My only gripe about the app is the drawing tool isn’t as crisp as I’d like, but it’s a minor complaint in an otherwise excellent app. Recycling Workshop shows how with a bit of imagination and creativity, throwaway objects can be reused and recycled. Simple and easy to use, kids can directly manipulate the objects on screen and use their own photos as background. This is an app where kids freely decide what to make; there are no set rules or scores. Overall, it’s a lovely little app that would appeal to a younger age group.